LANSING — A stretch of lakefront. Expanses of forest on either side. Abundant wildlife. These are characteristics that most people view as ideal for a family cottage or a retirement home. They are formally known as the wildland-urban interface and are detailed in a recently U.S. Forest Service publication. “The atlas brings together maps of the whole U.S. and each of the states that show where the wildland-urban interface is,” said Susan Stewart, one of the book’s authors and a staff scientist at the University of Wisconsin. It shows where housing and wildlife vegetation coincide. Housing includes individual homes, apartments and condominiums. Wildlife vegetation encompasses forest, grassland, shrub land, wetland and any vegetation that is not agriculture or otherwise human-planted. Both Winkler and Stewart said many states in the Great Lakes region struggle to expand their populations. Michigan lost population between 2000 and 2010. 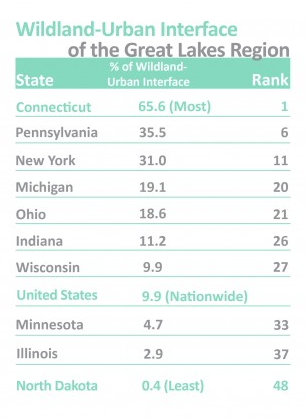 Of Michigan’s total area, nearly 20 percent is classified as wildland-urban interface areas. In Michigan and other Great Lakes states, that’s mostly due to seasonal homes often at the wildland-urban interface, Stewart said. They attract people looking for vacation or retirement homes. Because there’s a cultural ideal about “retiring to the lake,” the interface is more influenced by the age of the state’s population than total population, Winkler said. Many baby boomers reaching their retirement years have been considering — if not already building — a second home. Such areas are “natural amenity destinations” because their scenic beauty and outdoor recreation attract people, Winkler said. Other cultural concepts play into growth of the urban-wildland intersection, Winkler said. Demographers have noticed that especially in Michigan and other Rust Belt states with older cities, growth typically occurs on the fringes of cities in the form of urban sprawl, Stewart said. In cities like Detroit, growth manifests itself in the suburbs and beyond. In these states, expansion in the north is driven by seasonal and lake home development. Southern growth is primarily a result of larger urban populations building along the outskirts of town, she said. The intersection of wildlands and urban landscapes is expected to grow. And seasonal homes have increased as people have more vacations and time and good health at the end of life. With population increases come even greater housing increases and pressure for building sites, with accessibility and technology driving these types of growth. The study began as a way to track seasonal home growth in resort areas, Stewart said. However, the work became important to fire management agencies working to reduce fire hazards near houses. “When you want to do that, you need to know two things: where the vegetation is and where the houses are,” Stewart said. The Great Lakes region’s wildfire threats are less extensive than those in the West, she said. The Huron National Forest in Michigan’s northeastern Lower Peninsula, the eastern end of Michigan’s Upper Peninsula, the Wisconsin sand barrens, and areas in northern Minnesota have all burned. The interface has significance for far more than firefighting here because it shows where people and nature overlap and interact daily, she said. And while some species, like raccoons, skunks and crows, are relatively happy living around people, other birds and mammals avoid human activity. Animals like wolves don’t do well in fragmented forests, she said. These animals can cause problems, as when bears dig through Dumpsters or raid campsites. Pets at the interface also pose concerns, Stewart said. For example, cats kill birds and dogs disturb ground-nesting birds when they run free and sniff around the forest floor. Another concern is landscaping. Homeowners may water and fertilize their yards and often plant non-native species. New species and additional nutrients are a dangerous combination for introducing invasives that can significantly alter an ecosystem. Another bad habit is dumping yard waste in the nearby forest. “One doesn’t have to be an ecologist to understand that you’re probably introducing things into the forest that weren’t there before your house was there,” Stewart said. LANSING — John Gallagher profiles Japanese-American architect Minoru Yamasaki in his new book Yamasaki in Detroit: A Search for Serenity. Best known for his design of the World Trade Center in New York, a number of Yamasaki’s designs adorn Detroit’s urban landscape, including the One Woodward Avenue building (formerly the Michigan Consolidated Gas building).